Roasting vegetables is an excellent way to bring out the natural sugars which is what gives them that gorgeous, rich taste. 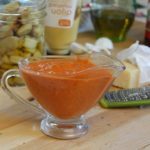 Tomatoes and garlic are especially flavorful when roasted which is what makes this Roasted Tomato Garlic Vinaigrette recipe so darn good! It’s a personal favorite on hearty pasta salads with lots of fresh veggies. My best advice to is make roasted tomatoes and garlic in bulk. Then store them in the refrigerator to use in recipes. I like to keep them in jars and lightly cover them in extra virgin olive oil to keep them moist. It’s very similar to buying sun-dried tomatoes packed in oil from the store. Except these have a much richer flavor! Small tomatoes like a cherry, grape, or Sweet 100 variety are perfect in recipes like my Roasted Tomato Garlic Vinaigrette. Just pre-heat your oven to 400°F. Line a medium baking sheet with parchment paper for easy clean-up. Place 2 pints cherry tomatoes on tray. Lightly drizzle with 2-3 tablespoons extra virgin olive oil. Seasonal with kosher salt. Roast approximately 30 minutes until slightly charred and bursting. Store extra tomatoes in an airtight container in the refrigerator for up to one week. Be sure to check out the tip below on how to make tomato water, another fun ingredient you can add to sauces and salad dressings! 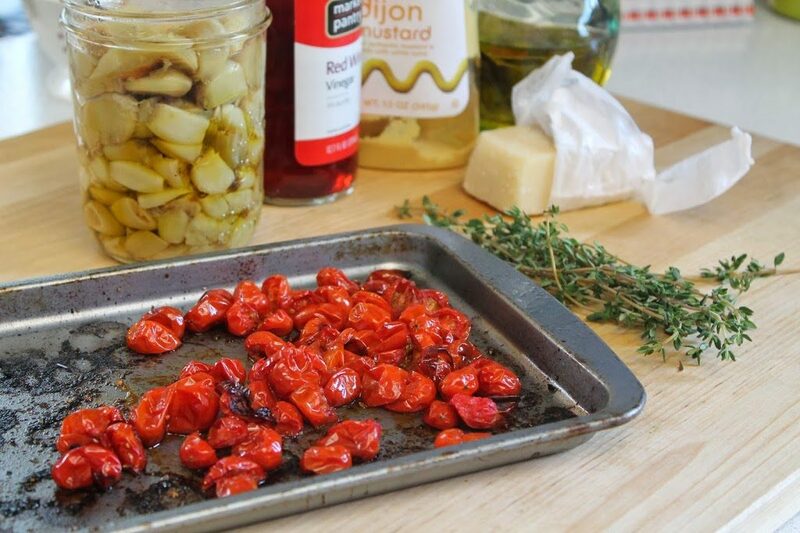 I hope you like this Roasted Tomato Garlic Vinaigrette recipe as much as my crew does. If you love this farmers market inspired vinaigrette recipe, you can find more like it by checking out my Dressing section! For recipe inspiration delivered to your inbox, subscribe to my newsletter, follow my photography journey on Instagram, and for generally inappropriate humor follow like me on Facebook! 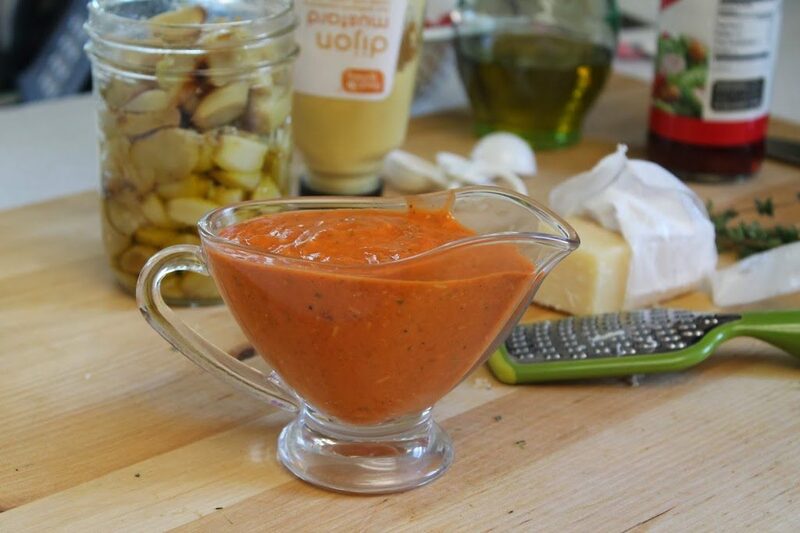 A rich, hearty salad dressing made from roasted tomatoes, roasted garlic, and fresh thyme. Dijon mustard and strained tomato water adds just a hint of tanginess. In a blender puree tomatoes, garlic, Dijon mustard, thyme, tomato juices, and vinegar. With the machine running drizzle in olive oil. Adjust amount of oil for desired thickness. Stir in the Parmesan cheese. Season with salt and pepper. Store dressing in an airtight container in the refrigerator for up to two weeks. Oil will solidify when chilled. Bring to room temperature and shake to combine before serving. Tip - To make tomato water place a cheesecloth line colander or fine mesh strainer over a larger bowl. Chop 2-3 large, overripe tomatoes into chunks. Toss lightly with kosher salt and place in the lined strainer. Cover with plastic wrap and put in the refrigerator overnight. Tomato water will collect in the bowl. Store excess refrigerated in an airtight container.